I read with interest yesterday a story in the Wall Street Journal about Sears Holdings Corporations annual shareholder meeting. Chairman Edward S. Lampert Chairman said that while he expects most Sears sales to continue to occur in brick and mortar stores, he would increase investment in internet experiments. According to the Wall Street Journal, Lampert’s goal is to capture the attention of shoppers at the crucial moment when they begin to discuss purchases with friends on social-media web sites and to research buying choices online. Toward that end, Lampert said the company may expand their MyGofer.com concept. MyGofer turns some stores into pickup locations for online sales while trying to bridge the gap between online sales and traditional stores. Sears owned Kmart unit also disclosed plans to let shoppers pick up merchandise at Kmart they have bought online. We believe shopping should be on your terms. That’s why we’ve created a simpler, more flexible, just plain better way to shop. We believe in giving you options. Lots of them. We believe you should be able to get whatever you want, how you want and when you want it. 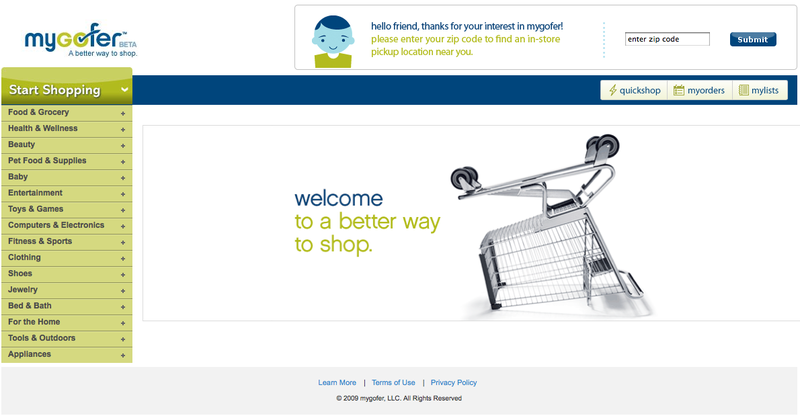 We’re designed to give you more choices to make shopping faster and more convenient. We want to become your ultimate one-stop destination. We carry a broader assortment than the traditional retailer – including everything from groceries to clothing to electronics to appliances. Our assortment is designed for you, giving you everything you need in one convenient spot. mygofer will evolve based on what you buy, and what you ask for. By listening to you, we will only get better. What can I find at mygofer? Pretty much everything. From toothpaste to tools to t-shirts, we have 1000’s of your favorite brands, all at one location. Imagine Saturday morning errands taking minutes instead of hours. Imagine what you could do with all that extra time. More choices, made easy- at competitive prices a broader assortment at your fingertips. You did not find what you were looking for? mygofer is designed to give customers more options, but also designed to make sorting and shopping through more options easy to navigate with features like shopping lists and quick shop. Our expanded assortment gives us the opportunity to showcase great products designed to meet a variety of budget ranges. Given our expanded network, we will leverage opportunities for additional savings through special discounts, clearances and short-term price adjustments. The correlation between researching online, buying online and buying offline have long been documented and discussed by the internet and search engine marketing community. To truly make Sears relevant to buyers who have begun researching their buying options online, Sears Holdings Corp. ought to first consider expanding the keyword terms they bid on in Google. Bidding just on branded terms like Kenmore and Craftsman while not bidding on appliance and power tools keyword strings like their competitors do by definition makes Sears less relevant than they could be. Once Sears and Kmart get in the search paid and natural game, they should then have someone who knows what they are doing fix and optimize their websites. SearsPortrait.com’s home page title tag says – you guessed it: Home! Sears may not own the SearsPortrait.com site and business. For all I know it could be leased. However, I am certain the new MyGofer.com site is owned by Sears Holding Corporation. It too, can use some attention and optimization if it hopes the online audience will find the site while researching where to buy products online.